This part three of eight posts about your chakras. We started with your root chakra, have moved now to your sacral chakra and are working our way up to your crown. 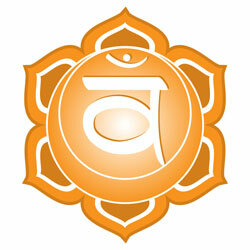 The sacral chakra, or svadhisthana chakra, is our creativity and sexual center. It is our passion and pleasure center. It is located above the pubic bone, below the navel, and is responsible for our creative expression. While your root chakra is satisfied with survival, the second chakra seeks pleasure and enjoyment. The second chakra is the center of feeling, emotion, pleasure, sensuality, intimacy, and connection. The energy of this chakra allows you to let go, to move, and to feel change and transformation occurring within your body. If the sacral chakra is blocked, we feel guilty, numb, lack emotions and sexual satisfaction. To balance this chakra, take a closer look at the situation that bothers you, fix the things you can fix and relax about those that can’t be fixed. Surround yourself with beauty and take your time to enjoy the things you like. Or, hit the mat! Some great sacral openers are: dancer’s pose, or natarajasana. Standing in mountain pose, tadasana. Inhale and firmly root your right foot into the ground. Move your weight into the right foot. Exhale and lift your left heel toward your buttock as you bend your knee. Reach back with your left hand and grasp your left ankle or your foot. Raise your right arm up towards the ceiling and hold it there. Begin to lift your left leg upwards away from the ground and your body. Keep lifting. As you lift your left leg, tilt your upper body forward. Hold the posture and feel the energy flowing through your pelvic area. And twisting triangle, trikonasana. Standing in mountain pose, tadasana. Exhale and move your left leg behind you. Your feet should be about 3 ft apart. Your right foot is facing straight forward while your left foot is turned outside at about 45 degree angle. Raise your arms sideways to shoulder level. Your left arm is reaching forward and your right hand is reaching to the back. Palms are facing the floor. Bend at your waist and lean forward. Rotate your body toward the right leg, reaching down to the ankle or to the floor. Stretch your right arm straight up, so it is in line with the left arm, or over your head. Hold the position and feel the energy flowing through your sacral chakra. Repeat on the other side. Let’s get those juices flowing..